The New Mexico Cancer Care Alliance Board of Directors voted to approve Presbyterian Rust Medical Center/Jorgensen Cancer Center and New Mexico Cancer Center-Gallup as new institutional participants. 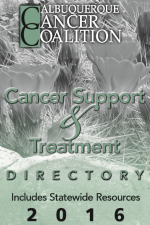 New Mexico Cancer Care Alliance, a 501(c)(3) charitable organization, offers New Mexico cancer patients and physicians access to the most up-top-date clinical research studies in cancer treatment. Our network of the major healthcare systems in Northern, Central, and Southern New Mexico and most of the community oncology professionals allows cancer patients to receive quality healthcare locally while increasing the knowledge of cancer care globally.